Nicholas Isherwood’s first experience as a stage director was Bruno Maderna’s opera Satyricon at the Carré St. Vincent in Orléans, France in 1990. He supervised the lighting, staging, costumes and programming of his sextet, VOXNOVA, from 1992-2008, notably directing Luciano Berio’s A-ronne in Alicante, Reims, Paris, Royaumont, Perpignan and Togamura, Japan. 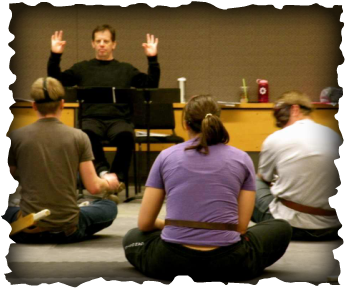 Isherwood has directed student productions of Adriano Banchieri’s La Pazzia Senile, John Cage’s Song Books, Karlheinz Stockhausen’s Am Himmel Wandre ich…, Purcell’s Dido and Aeneas and Mozart’s Die Zauberflöte at SUNY at Buffalo, Calarts and the University of Oregon. Professional productions include Hans Werner Henze’s El Cimarrón in Fontenay, Karlheinz Stockhausen’s Am Himmel Wandre ich… in Paris, Bari (Teatro Petruzzelli), Utrecht, Amsterdam, Torino, Steier (Steierischer Herbst), Berlin (Deutsche Oper), Macerata, Mexico City (Musica y Escena), Guanajuato (the Festival Cervantino) and Reims (the CNAT), John Cage’s Song Books at the Théatre de Bourgogne in Dijon and the Théatre Sylvia Monfort in Paris and Mauricio Kagel’s Phonophonie in Paris (Salle Olivier Messiaen), Venice (Teatro Fondamenta Nuova), Torino (Teatro Regio), June in Buffalo, Mexico City (Musica y Escena), Paris (the Salle Olivier Messiaen) and at the Stuttgart Opera. After taking a summer course on the “commedia dell’arte” with Antonio Fava in Regio Emilia, Isherwood has become increasingly interested in this art form. He has acquired a collection of masks and directed student productions of Adriano Banchieri’s La Pazzia Senile and Luciano Berio’s A-Ronne in traditional “commedia” style.